Next to Watermelon, Mini Me just LOVES popcorn. 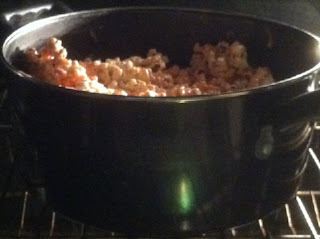 With his crazy dessert obsession, we end up making a quick batch of popcorn many nights to solve the evening munchies. So when it came to thinking of other Watermelon treats to have at his birthday party next week, we decided to give this Watermelon Popcorn recipe a try. It was super easy to make, it just took a LOOONNNNGGG time to make and a SHORT time to eat. I guess we'll be making another batch before the big party. 1. Pop a large sauce pan full of good popcorn. You don't want any kernels in it, so be sure to pick them out if you need to. 2. 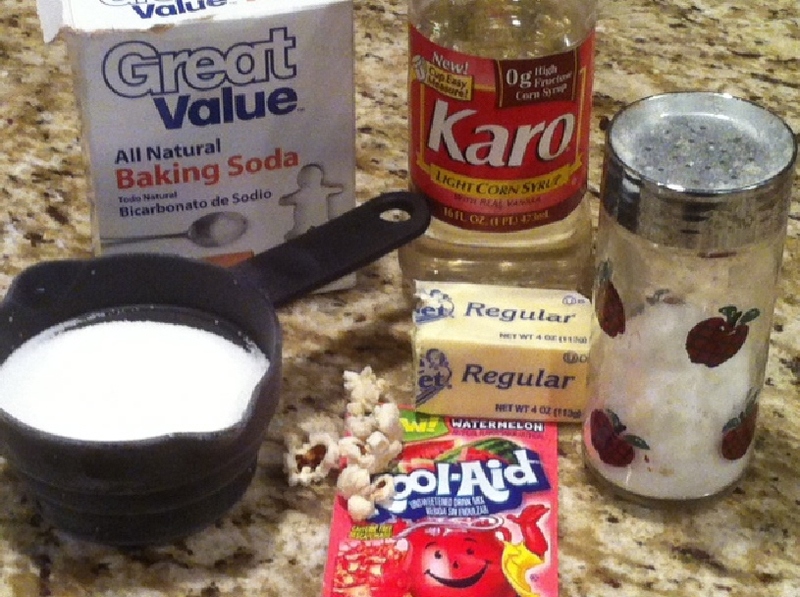 Add your butter, Karo syrup, sugar, and salt in a saucepan. Stirring occasionally, cook until the edges start getting bubbly. Reduce to medium heat and cook for an additional 5 minutes. 3. Remove from heat and stir in baking soda and Watermelon koolaid flavoring. 4. 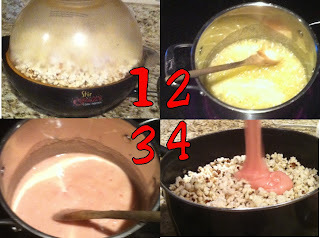 Pour the koolaid mixture on top of the popcorn and stir until well coated. 5. 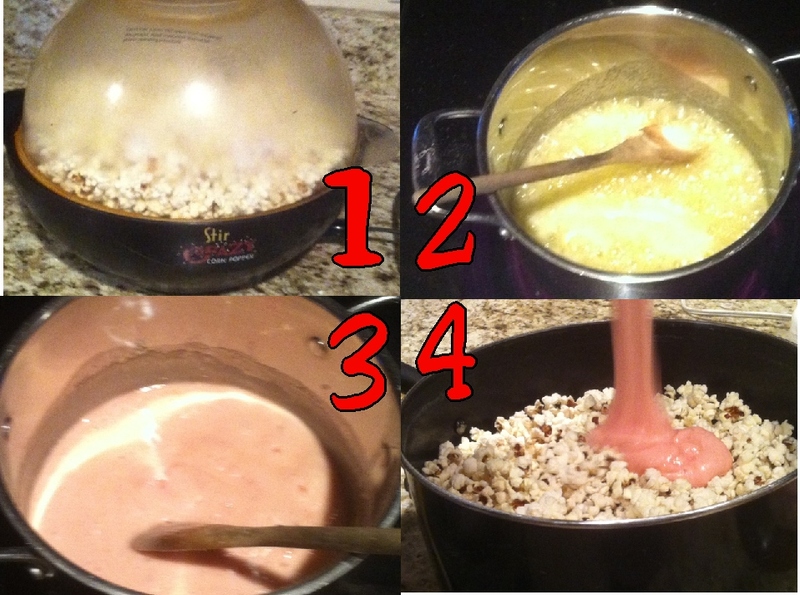 Place the popcorn into the oven and cook for 1 hour at 200 degrees, stirring every 15 minutes. 6. 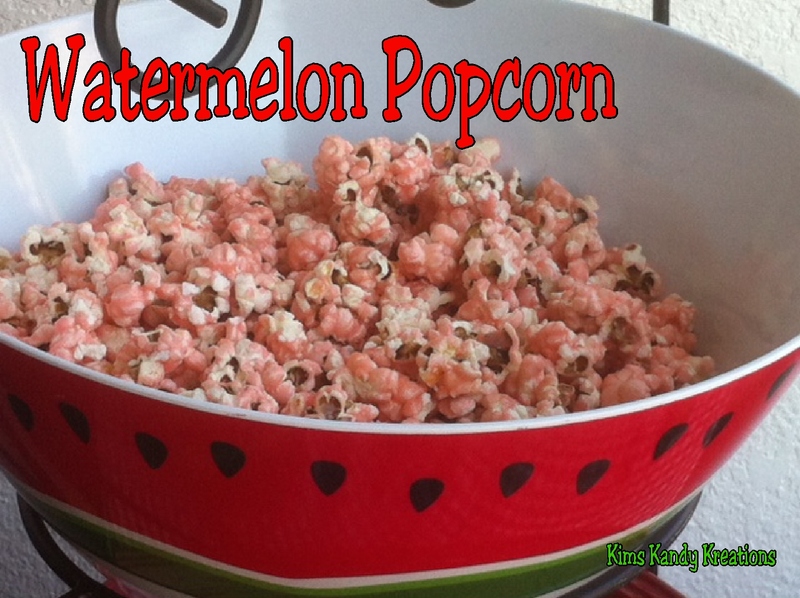 When your hour is up, pour your Watermelon popcorn onto a baking sheet and let cool. 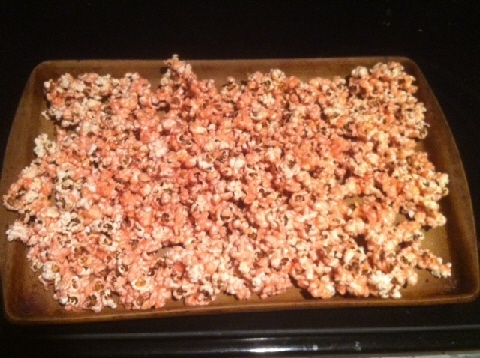 Then use your hands to separate the popcorn into individual pieces. To me, this popcorn tasted like popcorn drizzled with melted Jolly Rancher. It was really sweet and good. 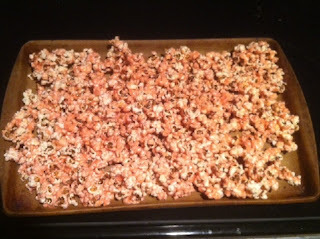 Plus, the cool thing about this popcorn is that you can use any flavor of koolaid and make any flavor of popcorn. Pretty easy and pretty yummy. What flavor would you make if you could?